Knee boarding not only offers an easy and safe introduction to towed watersports but it is also a fun way to get active on the water. Knee boarding is a watersport where the participant rides a board on their knees across the water whilst being towed by a motorboat. As knee boarding usually takes place on enclosed inland waterways there are no waves and so the boarder instead rides the wake of the motorboat. As with wakeboarding, water skiing and other towed surface watersports, the knee boarder hangs on to a tow rope pulled by a motorised water craft. The board itself is buoyant, convex and hydro-dynamically shaped and riders sit on their heels upon it, and secure themselves to the deck with an adjustable strap over their thighs. There are two types – trick boards and slalom boards. Knee boarding not only offers a relatively easy way to get into surface watersports but the skills and experience it introduces provides a great foundation for all towed watersports, such as water skiing and wakeboarding. It is also one of the safer of its breed because its low centre of gravity means riders less likely to fall off and when they do their falls are less dramatic. The rider also does not need to travel at riskier high speeds to appreciate the activity. The quickest and safest way to grasp the basics of knee boarding is to take a beginners course with a local watersports centre. The most reputable centres will provide all the necessary equipment so those wanting a taste of the sport need not splash out on expensive equipment until they decide whether knee boarding is for them. Knee boarding is also very popular for stag weekends, corporate events and other one-off fun days. These provide excellent opportunities to get a feel for the sport. Participants should be reasonably healthy and fit because knee boarding can be a physically demanding activity - maintaining balance, holding onto the tow rope and getting in and out of the water all help to put a strain on any rider. For this reason riders usually ride in short 10 or 15 minute bursts, otherwise exhaustion would quickly impair performance. 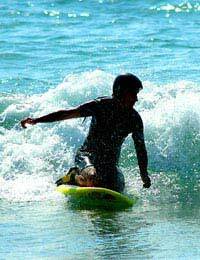 Riders should also be competent swimmers and feel confident in deep water, because, for beginners at least, as much time is spent off the board as on it. The two main safety precautions are standard with all towed surface watersports. Firstly all riders must wear a buoyancy aid at all times in the water and secondly all boats must employ an ‘observer’. This designated person must keep the driver informed as to the position of the rider at all times, whilst keeping their eyes peeled for other water craft and hazards in the water. An observer also offers the most reliable means of communication between the knee boarder and the driver. The rider can communicate with the observed with agreed hand signals, letting them know, for example, whether they are okay after a tumble. The motorboat should only need to reach speeds of between 12 and 20 mph. For safety the speed of the motorboat should be judged based on the weight of the rider. For example a feather light 40 lb rider only requires a boat travelling around 8 mph, whilst someone over 100 lbs would need a vessel travelling nearer 20 mph. The other important aspect of the boat is the wake it generates. As a guide, the wake of a good knee boarding boat travelling around 18 mph should be around 12 inches high with a sharp peak. The driver has the most responsible role, as they are not only in charge of the rider’s enjoyment but their safety and welfare too. It is therefore vital the driver is experienced and informed with a good knowledge of the safety, boat and water regulations.